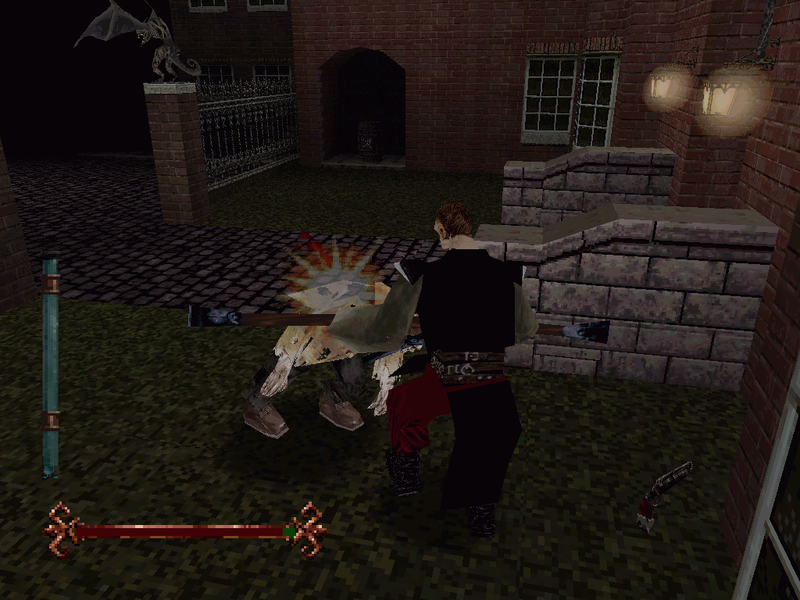 PowerVR made big waves in 1996, claiming impressive 3d performance figures and unique approach removing "memory bandwidth bottleneck". 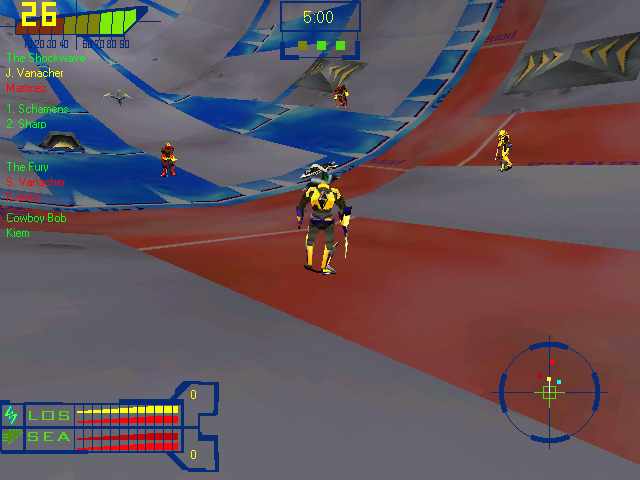 PowerVR was a 3d technology developed by Videologic, British company which in the middle of the 90's had strong position among multimedia and graphics products for personal computers. While Videologic's 3d team was developing own rendering techniques and logical design, they also needed a company which would translate it into real silicon and they found such partner in Japanese NEC. First PowerVR product targeted arcade systems and big names like Namco and Sega were developing games for it. Probably strong ties to Japanese games were created thanks to their close relationship with NEC, but that does not mean the hardware didn't have to be good. In fact screenshots from some games like Rave Racer are amazing and there were plans for a system more powerful than Real3D monsters. Early hardware design split the graphics pipeline into two chips: Image Synthesis Processor (ISP, codename Sabre, don't want to guess what it stands for) and Texture and Shading Processor (TSP, TexAS) and combined them with one surprisingly big bridge chip. This allowed ISP scalability, up to four chained in one machine, though the arcade hardware I've seen so far used only two ISPs. The basic single ISP and TSP configuration was first to be made available for PC gamers. It was not a retail product, Compaq used it for Presario line in second half 1996. It is codenamed Midas 3, and there is early SGL and DirectX 3 driver available. There are three chips in huge packages, probably because of their high pin count. Single chip solution was probably out of NEC's possibilities until later that year. All the memory chips came from NEC as well. Clock is sourced directly from 66 MHz crystal. 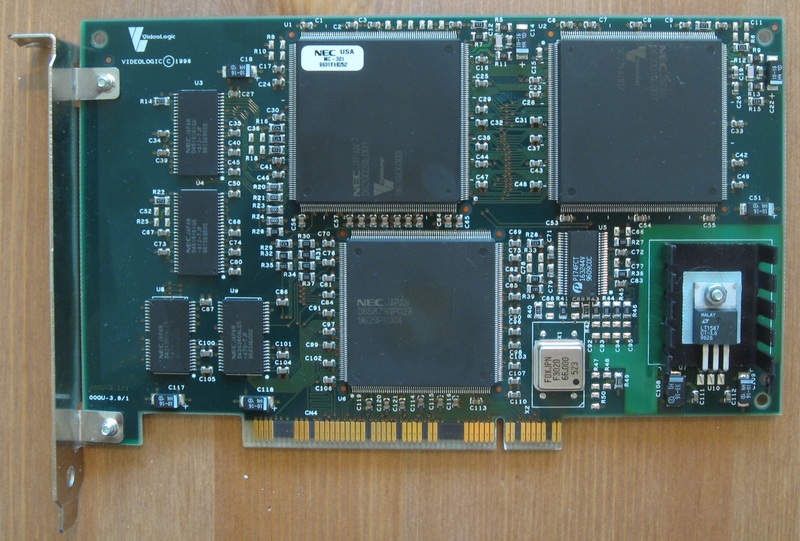 Pair of SDRAM in upper left corner is connected through narrow 32 bit memory bus. That is one megabyte capacity available for textures. Below these is additional pair of 512kB 16 bit chips to store geometry data, but this time it is Fast Page Mode DRAM. Deferred renderer needs to receive all the geometry before drawing begins, to perform their depth sorting. No display output is needed since images are sent to primary card over PCI bus and can be combined in frame buffer by controlled overlay. While it means lower cost, easier installation and no signal concerns like with Voodoo dongles this also makes PowerVR solution somewhat more sensitive to PCI bandwidth and primary card capabilities. PowerVR's hardware abstraction layer adds 3d acceleration features to primary card, making it virtually single device. Since the primary card serves as a framebuffer, available 3d modes are dependent on amount of video memory of primary card. Maximum resolution of Midas 3 is 1024x1024, and since PowerVR advertised besides 16 bit also native 24 bit output, double buffered rendering at maximal resolution would require primary card with at least 6MB of memory. Even if Midas 3 does not have the power to actually push games in that resolution, it would not be found in systems with weak display adapters. Steep CPU demands would restrict its usage to high end PC's anyway. Unlike younger PowerVR cards this one eats some watts and needs heatsink for power regulating transistor. Question is how to calculate bandwidth of local memory. There is obvious 240 MB/s peak for the texturing buffer, but additionally the geometry memory, also with 32 bit bus and 66 MHz clock. In Fast Page operation latency is 45ns, making it potentially big addition. If I am right and it only serves as a buffer for PCI communication, then it should not be added to the texturing bandwidth. The chip's features has three main highlights: Infinite Planes, "tiled deferred" rendering and on-chip "Z-buffering" equivalent to 32 bit precision. Tile rendering divides the screen into small tiles and draws all of it, dump it to primary card and then moves onto another tile. Midas 3 first gathers all the geometry for given frame in memory connected to the control chip. ISP contains 32 processor elements working on one pixel each. It discards hidden pixels and for those visible finds closest surface from which color will be determined. Z-buffer in local memory with its hassles is completely eliminated, leaving more capacity and bandwidth to texturing. Rectangle of visible pixels is called a tile, and the tiles are processed one by one in ISP. Plentiful artifacts may be good for exposing tile size- 32x32 pixels. Only proprietary API unleashes possibilities of Midas 3. Infinite planes or n-sided polygons were not part of Open APIs and full capabilities of PowerVR can be exploited only through proprietary SGL API. It is high-level object oriented API used by approximately 20 games and of course PowerVR's demos. 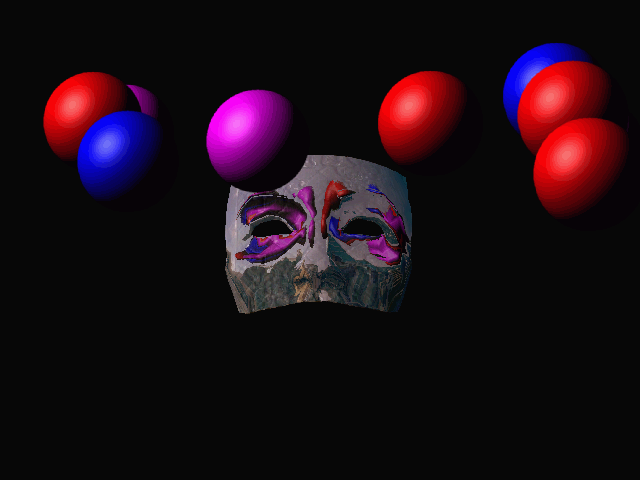 The API also supported data instancing to save memory by avoiding duplicates of materials, transformations and objects. Midas 3 is compatible with PowerVR driver versions 3.x and latest I found was 3.1c3 from spring 1997. I would like to test performance differences with various primary cards, but at first it seemed to me Midas 3 was working pretty much only with Virge cards. Guess that is what the Presario line was using. Actually the Virge /GX2 used in the beginning brought me more problems than the Midas actually have. With Verite as primary adapter it works much better (thanks Vetz). I used 2200 AGP 8MB model hoping that is the fastest choice for PowerVR. Nightmare Creatures in glorious 1024x768 resolution- example of PowerVR Extreme title. While PowerVR's demos are working, most of SGL games will reject Midas 3. The version 3.x SGL libraries do not support features that PCX enjoyed. MDK, Tomb Raider or Unreal are among such games, along with minigl libraries for PCX. Direct3d compatibility is also somewhat reduced, talk about baseline. Specular highlights are possibly supported, but anything else than d3dtest will crash the system. When using Virge as primary adapter newer d3d games will usually end in black screen after first frame is rendered, and you can just blindly restart your computer. Let's go over games that run nonetheless. First CartX racing, full of polygons popping into track, invisible cars, sky filled with random garbage and broken transparency. Daytona USA Deluxe with first driver run without fog, car textures randomly disappearing and soon froze. With last driver the Midas 3 tried to render fog, but even more artifacts occurred, making the game unplayable even if it did not freeze in the same place like reference driver. 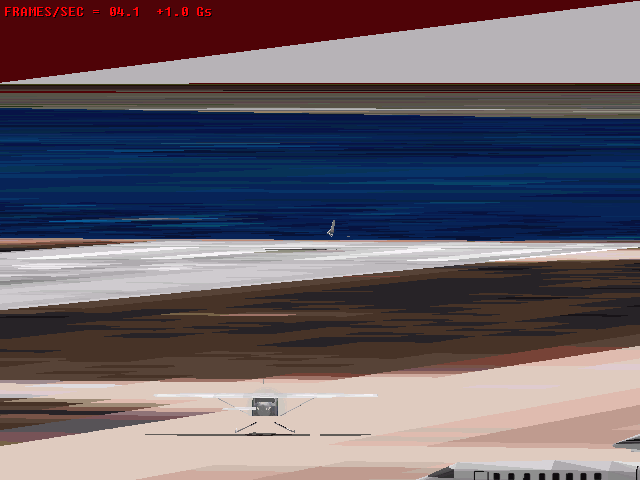 Flight Simulator 98 is a keeper, but framerate and stability were insufficient. Flight Simulator 98 is one of those games that gives a chance to any d3d accelerator. 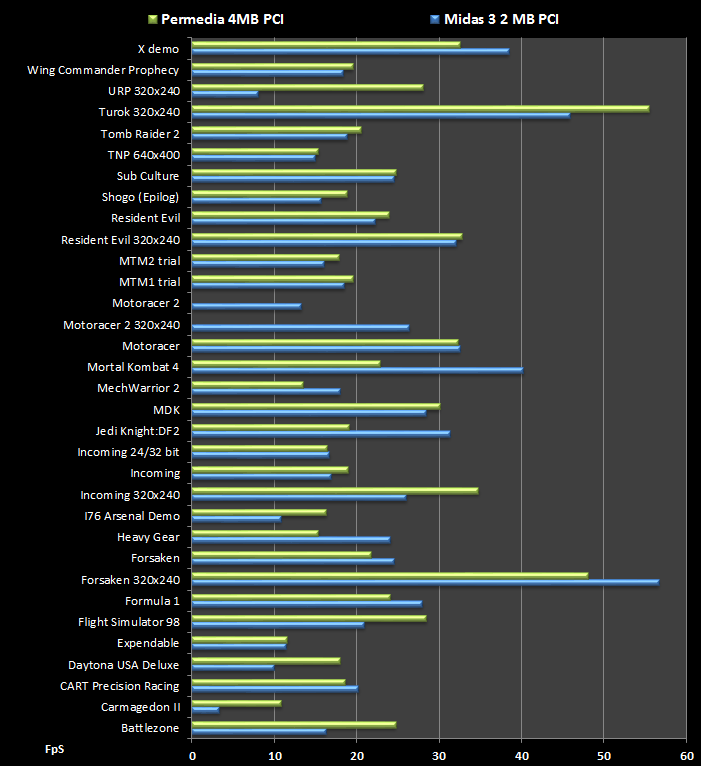 Finally, what do those DirectX games Midas3 handles say about its performance? It is quite far behind theoretical values, and probably not only drivers are to blame. Even in SGL, to me rather surprisingly, Midas 3 is obviously slower than PCX1. POD for example, with it's unmodifiable PowerVR preset, has troubles reaching 20 frames per second. Click on the image to see minimal framerates. Here is comparison with Permedia-Ti by 3DLabs. While the Permedia had own bunch of issues with color blending and bilinear texture filtering, it undoubtedly produced better image quality. Uneven match up at first look, even when the one result from d3d emulation layer is excluded. The poor performance in Carmageddon II, albeit still higher than NV1 by the way, thus should not be counted. Midas 3 offered around 90% average framerate of this particular Permedia-Ti. By extrapolation of the result we get speed parity with first Permedia produced by IBM, which was also closer to market availability of Midas 3. The minimal framerates are disappointing, Midas 3 dives by whole third lower than Permedia. This PowerVR chipset did not offer much of the declared revolutionary 3d performance. Only upside is little to no performance decrease in true color modes. Midas 3 was rather short lived product, not much better than first consumer 3d accelerators. It is partially dictated by limited hardware abilities under open APIs, small texture memory, but also by interrupted driver support. It is not hard to see why, the following single chip product was a lot more efficient solution. But if I was a gamer owning Midas 3, I would probably be dissapointed and look for upgrade elsewhere than Videologic/NEC. Perhaps fortunately for them, it was limited deal and not many people spent money on unproven accelerator. There is but a handful of SGL and D3D games this card can start, let alone play properly. And it promised so much more. However, PowerVR delivered more mature PCX1 chip long before the limitations of Midas 3 could become obvious.